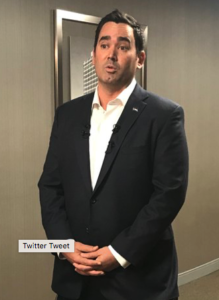 As FOX 31’s Joe St. George reports, GOP gubernatorial candidate Walker Stapleton’s signature gathering effort to reach the primary ballot, which collapsed after allegations of fraud leveled by a competing candidate turned out to be correct–enough that Stapleton was forced to withdraw his petitions after they were certified by Colorado’s Republican Secretary of State, and proceed to reach the ballot via the party’s state assembly. The complaint was filed by Jason Legg with Strengthening Democracy Colorado, a group known for suing elected officials and government agencies over transparency issues. The DA’s office has confirmed it has received the complaint. Much like the belated attempt by 2016 U.S. Senate candidate Jon Keyser to shift the blame for forged petitions submitted by his campaign to contractors he hired to collect the signatures, Stapleton has tried ever since this scandal broke to focus the attention on Kennedy Enterprises, a signature gathering outfit with a long history of petition fraud and dangerously lax hiring standards–exactly the problems uncovered this year in both Stapleton’s and Rep. Doug Lamborn’s petitions. As readers know, Lamborn is fighting a last-ditch federal court battle to get back on the primary ballot after losing his case at the Colorado Supreme Court. But we’ll say it again and again: the problem is not Kennedy Enterprises. Kennedy Enterprises is a symptom, not the cause, of a larger problem in Colorado politics involving the use of fraudulent petitions as a substitute for bonafide popular support. Petitions were never intended to be the method by which a majority of candidates reach the ballot in a primary election, bypassing en masse the traditional route of building rank-and-file support through their parties’ caucus process. After Kennedy Enterprises got busted for fraud repeatedly in recent elections, including felony charges against a signature gatherer resulting from fraud in the 2013 recalls, the candidates who employed them knew what they were getting. They knew, and they didn’t care. The relative convenience of essentially purchasing one’s spot on the ballot, which candidates have enjoyed for many years without scrutiny until Keyser spoiled the party in 2016, is now a liability for candidates who didn’t care about the integrity of that process. The well-documented dubious history of the consultants Stapleton hired makes it impossible to claim this kind of blanket ignorance. And with another Colorado election marred by fraud, it’s time to ask what Stapleton knew. And when he knew it. Just like Keyser, it’s not a question of Stapleton being “on the ballot.” He’s on the ballot. But the hard questions Stapleton needs to answer now, and could be made to answer in a criminal investigation, will dog him all the way through the primary–and beyond in the event he manages to hold off his Republican challengers. Petition fraud doesn’t happen in a vacuum. No matter how hard it gets spun, petition fraud reflects negatively on the candidate whose campaign commits it. If you don’t like that, encourage your candidate to insist it be done right–or to make the ballot the old fashioned way, by convincing real people in your party to support you. There’s absolutely no way, when Walker Roberts claims to be ignorant, that anyone is going to be credibly able to argue he’s not . . .
. . . hell, he’s even got genetics on his side!